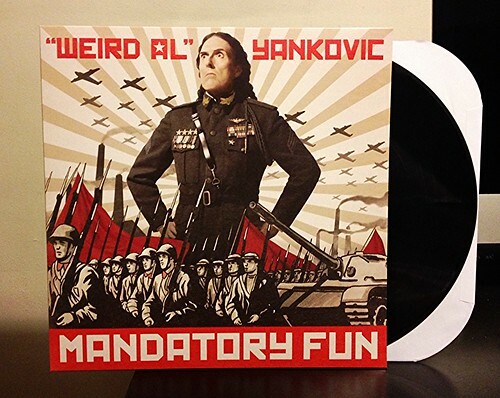 There's something just so gosh darn comforting about getting a new Weird Al album on vinyl. Talk about an instant gateway to my childhood. The Blues Brothers and Weird Al practically defined my earliest musical memories. The fact that Al is still around and putting out new records and remaining relevant to the next generation is just remarkable. The fact that this record debuted at number one on the Billboard charts was also really cool, even though that certainly doesn't mean what it once did. As far as the record goes, I have a bit of a dilemma when it comes to the more modern Al records. The problem is I have no idea what songs he's parodying any more. I was kind of aware of the "Blurred Lines" song because I saw it performed on the Colbert Report and I think I heard it in Sears once. That being said Al's "Word Crimes" version is simply genius. Lyrically, he's at a level so much higher than the rest of the entire world. The other parodies are all a good time, even if I don't know the originals. The song about tin foil in particular is really funny. He also has a song called "Tacky" which is a parody of that "Happy" song I've heard in car commercials. Lyrically great, but musically that's a pretty annoying song. As always Al's originals are top notch and they still feel like a little slice of his music from the 80's to me. My favorite being the guitar focused rock song "My Own Eyes." And par for the course, Al has a Polka medley and as usual is one of the album highlights, though again, I don't recognize 3/4s of the songs he's doing on this one. Maybe I'd be in better shape if I spent more time hanging out and listening to the music they play at SuperCuts. Who would have thought that 28 years after I bought my first Weird Al record, I'd still be buying new ones. I'm thrilled he is still releasing records and even more thrilled that his record label saw fit to give it the vinyl treatment. Weird Al Yankovic - "Word Crimes"